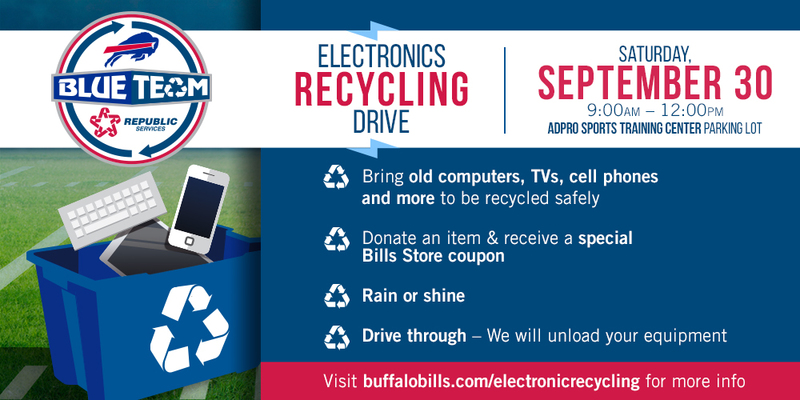 The Buffalo Bills have once again teamed up with Republic Services to hold the fifth annual Electronic Recycling Drive! Hosted in the ADPRO Sports Training Center parking lot on Saturday, Sept. 30, Bills fans can stop by from 9 a.m. – 12:00 p.m. to recycle old computers, televisions, cell phones and more. Fans who donate an item will receive a complimentary Bills Store coupon! For more information on acceptable and non-acceptable items, please visit here.